The Club Magazine Steaming is a high quality well respected quarterly magazine sent free to all members. Printed in full colour on heavy art paper it is packed with superb pictures both archive and contemporary and plenty of interesting reading too. Every issue keeps you au fait with activities in the Trust and carries up-dates on such subjects as insurance and safety. 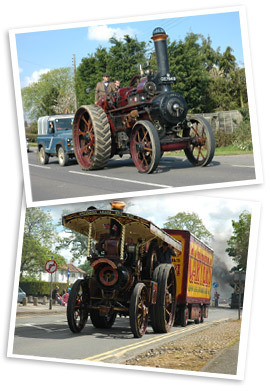 The popular Steaming Around feature is a digest of steam happenings round the country, much based on reports sent in by members and appearing only in our pages. These regulars are backed by authoritative deeply researched historical features, lively debates on technical topics and thumbnail sketches of well known and not so well known characters in and around the movement. Unlike news-stand glossies Steaming (the only preservation journal to deal exclusively with Steam) belongs to the Trust and its members, it is in many ways their “Parish Magazine”. Contributions in words and pictures are warmly welcomed from members, authorised events and affiliated clubs alike, indeed they are the life-blood of the magazine. If you’ve never thought about writing for Steaming or feel a bit nervous about trying - now’s the time to give it a go. Specialist Journalists whether trust members or not are welcome to submit material –but sorry there’s no payment! This great magazine has enjoyed a history that is now 60 years old and its authoritative and wide ranging content has ensured that it has become a collector’s item in its own right. Be a part of it! The editor of Steaming Kevin Mills can be contacted via steaming@ntet.co.uk.